Tags: challenges, Hiking, Inspiration, Kilimanjaro, outdoors, success, winter. Mount Kilimanjaro is the is the highest mountain in Africa and the highest free-standing mountain in the world. Photo courtesy of Wikipedia. Our early plans for this epic climb have grown considerable as our winter training hike demonstrated. Each of us has been in various ways attending the training and conditioning we will all want for the successful experience we hope is ahead. Just four short months remain before we will board planes and fly to Tanzania to begin the official expedition. The questions have begun in earnest and our teamwork must now also begin in earnest: What route are we taking? How many days will it take? Where is Autumn going to be staying? What’s the most challenging part? When do we summit? Will we have updates? The truth is most of these already have answers and I’ll provide more now but the full trip sharing is still ahead as we must first finalize all the details of our teamwork ahead. We are working with an expedition company called “Climb Kili” and will be using the most commonly traveled Machame Route up the mountain. We expect to depart the United States near the middle of September and return in very early October. The climb itself will involve six days of ascent with a summit planned for dawn after an all-night hike under a full moon. The sunrise from atop the tallest standalone mountain in the world has an incredible allure, though we all recognize the amount of work involved for all of us to experience this together. 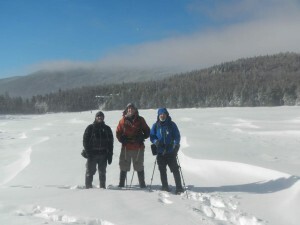 Group shot on Franconia Notch on a training hike last winter. Speaking of which, Autumn is not joining us for the trip as the impact of low oxygen upon a dog is something we do not understand well enough to undertake at this point. She has plans to stay with Chrissie Vetrano of Guiding Eyes where she will get incredible love and care as well as some potential opportunities to show off at Guiding Eyes for the Blind! While we are there we have decided to undertake a four-day safari following our climb. It is unlikely that many of us will ever have such an opportunity again and thus it was an easy part of the plan. There are so many safari variations and we are building ours to take advantage of the best regions for the season we are there. So what can we do to train? We are all building aerobic conditioning. Running, biking, and climbing locally are certainly some ways. Stair climbers and treadmills can help though we simply need to get time out in the mountains as often as possible this summer as well. We have an oxygen-restricting mask to help simulate the low oxygen of higher altitudes when it is literally one breath per step to ensure the muscles have the oxygen they need to function. Equipment research and purchasing is happening. Finding ways to fully share all of the experience ahead is one of our goals. We’ve even heard from a company giving consideration to sponsoring our trip on our more significant scale but all of that remains for future development. Today we just want to share a little more and invite any of your questions or comments about the great adventure ahead! So exciting!The training must be a tremendous amount of effort, but I’m glad to hear you’re all doing it. Can’t wait to hear more…and of course hear the stories of your African adventures this fall.